A BadgeChain is a distributed database: badges are stored all over the Internet. New objects can grow organically from the aggregation of badges in the BadgeChain — e.g. ePortfolios. How is the BadgeChain practically stored? How can we trust the content of the BadgeChain? The public keys are used as the identities of the participants in the network. The private keys are used to encrypt information that can then be deciphered using the matching public keys. 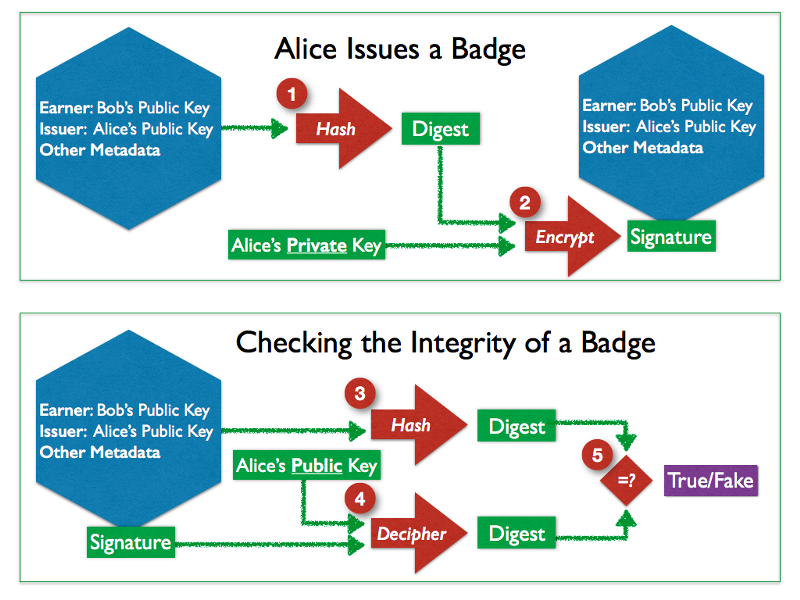 The picture below illustrates the process when Alice creates a badge containing the information that will be used to verify whether it is authentic or not. How to create trustworthy badges using cryptography? In the previous post, we looked at the relationship between trust, Open Badges and blockchains. To paraphrase George Bernard Shaw, one could say: Open Badges and blockchains are two technologies separated by a common idea [trust]. 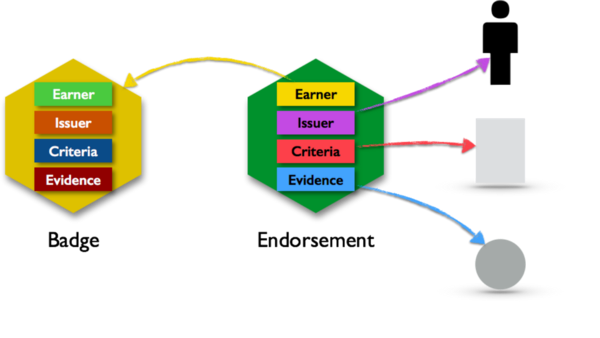 To explore how Open Badges and blockchains could merge into a new technical object, my reasoning will pass through several stages. We will start with a BadgeChain that does not make any reference to the blockchain technology, then, step by step, we will describe the mutation of this initial object through the incorporation of new genes into its DNA — hoping that we will not have created a chimera! Indirectly: badges are “connected” through each individual issuer and earner. The issuer is a kind of “connector” between all the badges issued (and their earners), the earner is a kind of “connector” between all the badges received (and their issuers). Badges can also be connected through the alignment metadata, a list of objects describing educational standards — a property of the version 1.5 of the standard that has not been widely exploited. Directly: badges are literally linked to other badges. For example, an endorsement badge could use the address of the badge being endorsed as the identification for the earner of that badge.